Someone had burned a little incense, the room was warmly lit and there was some low-level R & B playing in the background. The space was a welcome refuge from the frigid temperatures outside and the recent media mayhem stirred up by a self-proclaimed “stable” and “genius” commander in chief. Christina and Collins welcomed us, introduced the evening, and lead us in a moment of silence for Erica Garner and all the other “she-roes” we have lost this year. That silence was deep and it successfully set the tone for the work to come. Choreographer Keisha Janae started the evening with her solo, “I Am Digging. We Are Haunting” and performed it with such a sophisticated level of clarity and nuance that I was surprised she is an “emerging” artist. This woman can hold her own. 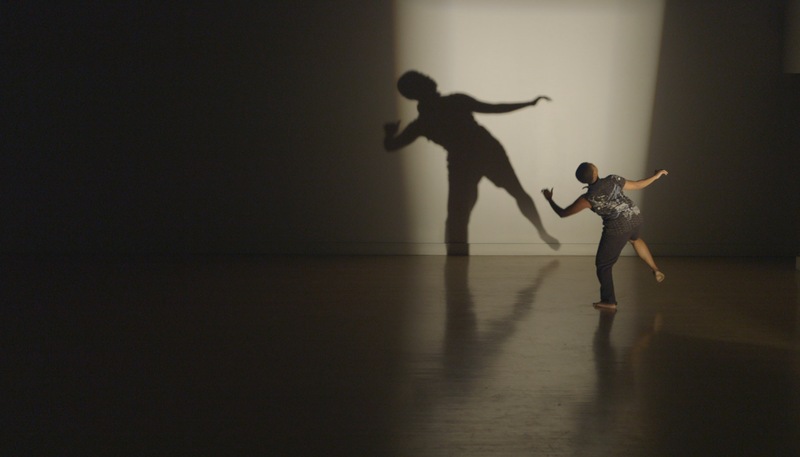 Mirrored by her life-sized shadow (lighting design by Giau Truong), Janae scuffed, stomped, scuttled and glided her way back and forth along a steep diagonal. She was pulled toward the downstage right corner by a force not-altogether-known but represented by an effective prop: a large industrial fan with long black and purple fabric strips tied to its frame. When the fan began to blow mid-way through the piece, the fabric spread its tentacles up and toward Janae. At first resisting its suction, she retreated only to return head-on letting the fabric caress her bald head, neck and arms. She stood within its reach breathing, blinking and finally allowing a sense of relief. If this sounds dramatic, it was. But there was no melodrama in this performance. Instead, Janae offered a sincere portrayal of a complex experience. Without knowing what, we could tell that she was processing something, that the process took effort, and that she was staying absolutely present within it all. Janae’s compositionally clear use of space and efficient execution of movement provided a solid framework over which an emotional truth was layered. It is not easy to combine choreographic intrigue with psychic poignancy; indeed we spend years experimenting with the alchemy of those variables. With her current degree of aptitude, one can only imagine the potential of Janae’s creative work in the years to come. Following Janae was another striking solo of an entirely different style. Trinity Dawn Bobo’s “Mid. dle” began with a series of real time “snapshots” of Bobo in various postures. Seated against the back wall in a soft black hoodie, drawn low above her brow, Bobo changed positions as lights (also by Truong) flashed on and off and the sound (designed by Bobo) of a faintly ticking clock alluded to the passing of time. This person was trapped or waiting, either not allowed or uninterested in moving beyond the confines of that pool of light. Eventually she emerged and slowly—was her speed an act of defiance or apprehension? A choice or reaction?—made her way to a structure downstage with a metal bar across the top. She grabbed on, swung her legs up and over, and began to hang. Most of us have had the experience of hanging upside down and can remember pretty clearly the feeling of blood rushing to our heads, our spines stretching out, and the cold bar making a mean impression on our skin. These sense memories made watching Bobo in this position particularly harrowing. Her arms were dangling, her legs were gripping the metal bar for dear life, her belly, although covered, was exposed. From this position she said, “I am very tired…I am stuck.” Gravity was at play here, both literally and figuratively. When she finally released herself, she lay slumped on the ground, face to floor. And yet she rose again. Next dancing behind the structure, then on and around a neighboring table. “Mid. dle” might have had the feeling of a series of incomplete thoughts, structured as moving images, but the cumulative effect was powerful. Bobo performed with a vulnerability that was heartbreaking and utterly relatable. She has the beginning of an evening-length solo here; let’s hope she develops it further. Again, these young dancers were not pretending to project these emotions and experiences, they gave authentic performances. I cannot stress enough how rare a skill that is in the contemporary dance world. It can also be incredibly draining for performers to sustain. It will be interesting to watch them tone the dial of their (willing) vulnerability on stage in the years to come. In the meantime, this entire production was a much welcome offering of vigor, contemplation, complexity, determination and warmth. If this is the next generation of dance makers in Chicago, the bar has been raised.